Photos by Deborah Scott and Anne Peters. ©Deborah Scott 2003; © all rights reserved. ©Anne Peters 2002; © all rights reserved. The beautiful horse cemetery at NORMANDY FARM is actually a burial place for horses owned by the property's former owner, Joseph E. Widener. In Widener's time, the farm was part of the historic ELMENDORF FARM, owned by Daniel Swigert, and previous to that, was known as the PREAKNESS STUD of Milton Sanford. At the dispersal of the Nursery Stud of August Belmont II, Widener purchased the leading sire FAIR PLAY, and the broodmare MAHUBAH, and several other horses, and brought them to Elmendorf. FAIR PLAY and MAHUBAH were the sire and dam of MAN O'WAR. A beautiful bronze statue of FAIR PLAY is the focal point of the cemetery. Buried in front of the statue is FAIR PLAY and MAHUBAH. Behind him are the leading sires CHANCE SHOT and *SICKLE, and another good homebred sire HASTE, whose daughter QUICKLY produced COUNT FLEET. Widener collected several other horses at the Belmont dispersal, including CHANCE SHOT, and the imported mares *QU'ELLE EST BELLE II (French Oaks) and her daughter *QUELLE CHANCE, dam of CHANCE SHOT and CHANCE PLAY, both by FAIR PLAY, and both top class runners and sires. CHANCE PLAY, the older of the two, won the Saratoga Cup and Jockey Club Gold Cup. 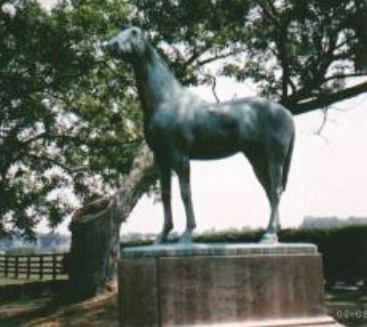 He initially stood in New York and later at Calumet Farm, becoming America's Leading Sire in 1935 and 1944. CHANCE SHOT won the Withers Stakes and Belmont Stakes, and retired to stud at Elmendorf Stud in 1930 to replace Fair Play, who had died there in 1929. He sired PEACE CHANCE, FAIRY CHANT, CHANCE SUN, BUSHWACKER, SHOT PUT, and YOUR CHANCE. *BLUE GLASS also came from the Belmont dispersal and was already dam of stakes winners BLIND PLAY and BROADSIDE. For Widener, she produced Belmont Stakes winner HURRYOFF (by HASTE) and UNBREAKABLE (by *SICKLE), who in turn, sired POLYNESIAN (bred by P.A.B. Widener and the sire of NATIVE DANCER). One of the few good fillies Widener bred by FAIR PLAY was STAGECRAFT, who is buried here. She produced 2 very good colts by *SICKLE in STAGEHAND (champion at 3) and SCENESHIFTER. Widener's grand gelding OSMAND is buried here. His dam ORMONDA also produced the excellent colt BREVITY (by *SICKLE), and the mare DUSTWHIRL, who became the dam of WHIRLAWAY. Widener also bred Rose Pompon (a half-sister to HASTE's sire MAINTENANT) and Rose Pompon's daughter ZEPHYRETTA, both stakes producers. OFFENSIVE, a half-sister to Widener's good runner ROMAN, produced the flashy colt SLAM BANG. The mare PEACE (by Widener's one-time stallion *STEFAN THE GREAT) produced Belmont Stakes winner PEACE CHANCE (by CHANCE SHOT). The imported mare *La Roseraie was the dam of *AMBROSE LIGHT and CHANCE BULLET. The mare NATURE was bred like a princess, a daughter of *MEDDLER and the champion mare CORRECTION, a full sister to DOMINO. She produced stakes winners CHICLET, NATURALIST, and CARNATION, and is a tail-female ancestress of Triple Crown winner AFFIRMED. *NIPISIQUIT was imported with her daughter *MINNEWASKA in 1932. *MINNEWASKA produced Grand Prix de Paris winner AVENGER II, and *THE SQUAW II (by *SICKLE), dam of HOW AND CHEROKEE ROSE II, and ancestress of TOM ROLFE, ACK ACK, SHAM, and CHIEFTAIN. In 1951, E. Barry Ryan purchased the section of Elmendorf with the cemetery and renamed it "NORMANDY FARM." (Other sections of Elmendorf became George D. Widener's Old Kenney Farm, Maxwell Gluck's Elmendorf Farm, and Robin Scully's Clovelly Farm). Ryan's broodmare band included the classy racemares and producers ALABLUE and BONNIE BERYL. ALABLUE, dam of ALANESIAN and MIDDLE BROTHER, is now the ancestress of BOLDNESIAN and CRYPTOCLEARANCE. BONNIE BERYL produced 3 stakes winners including the champion filly BUG BRUSH and the good colt NASHVILLE. Ryan's outstanding filly FIRM POLICY won the Alabama Stakes and Monmouth Oaks, and only made the mistake of coming in the same crop as an even better filly named CICADA. Ryan also bred and raced the top grass runner QUICK PITCH, who made the successful switch to hurdles and steeplechases. NORMANDY FARM is again under new ownership, but welcomes visitors wishing to pay respects at the cemetery. -- A.P.